Offer your customers a convenient way to carry home their purchases with our Navy Blue Paper Shopper! 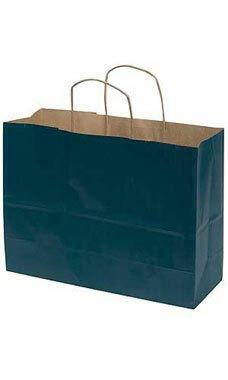 In these Navy Blue Paper shopping bags, your customers will be able to take home a variety of purchases. Add tissue paper, ribbon, or raffia and transform these shopping bags into gift bags to show your customers that you truly appreciate their business. Designed with twisted rope handles, side gussets, and tear resistant paper, these durable shopping bags will conveniently stow away behind the checkout counter. Sold in cases of 25.